In recent years the organisation and practice of collaboration in the life sciences has undergone radical transformations, owing to the advent of big science enterprises, newly developed data gathering and storage technologies, increasing levels of interdisciplinarity, and changing societal expectations for science. 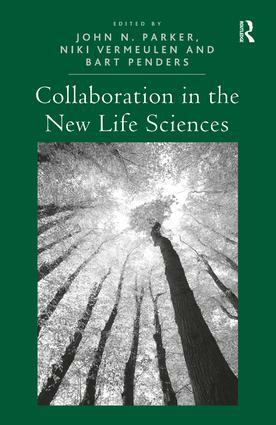 Collaboration in the New Life Sciences examines the causes and consequences of changing patterns of scientific collaboration in the life sciences. This book presents an understanding of how and why collaboration in the life sciences is changing and the effects of these changes on scientific knowledge, the work lives and experiences of scientists, social policy and society. Through a series of thematically arranged chapters, it considers the social, technical, and organizational facets of collaboration, addressing not only the rise of new forms of collaboration in the life sciences, but also examining recent developments in two broad research areas: ecology and environment, and the molecular life sciences. With an international team of experts presenting case studies and analyses drawn from the US, UK, Asia and Europe, Collaboration in the New Life Sciences will appeal not only to scholars and students of science and technology studies, but also to those interested in science and social policy, and the sociology of work and organisations. Bart Penders is an assistant professor in Biomedine and Society in the Department of Health, Ethics and Society at Maastricht University, the Netherlands. He is co-editor of Collaboration Across Health Research and Medical Care. Niki Vermeulen is Lecturer in the History and Sociology of Science at the University of Edinburgh, UK, and co-editor of Collaboration Across Health Research and Medical Care and Bio-Objects: Life in the 21st Century. John N. Parker is an Honors Faculty Fellow at Barrett, The Honors College at Arizona State University. He is co-editor of Collaboration Across Health Research and Medical Care.